Having a little extra money in your pocket is always nice, especially when you’re a kid in high school. Justin Perez is that kid in high school. 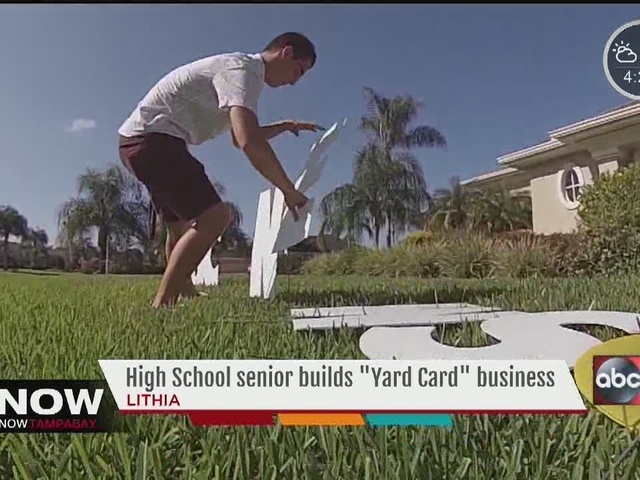 A senior in high school in Lithia, Perez says he has found a way to make thousands of dollars by just working a few hours a few nights a week. His business is called “Yard Cards R Us”. For $30, Perez will take your order for what you want spelled out in your front yard, must be appropriate for little eyes of course, and will show up at your house at night, put up your sign and collect his money. Then, 24 hours later, he will return to get the letters you rented. The Yard Card idea coming from his mother. The novel idea has taken off. Signs welcoming troops back home, to birthdays to Mother’s Day. You name it and Perez will make it happen for you. For more information on Yard Cards, just search Yard Cards R Us or call them at (813) 653-1012.